Welcome to the brand new tallncurly.com! Please sit down, make yourselves comfortable. Have a cup a tea, a lil’ mojito maybe? 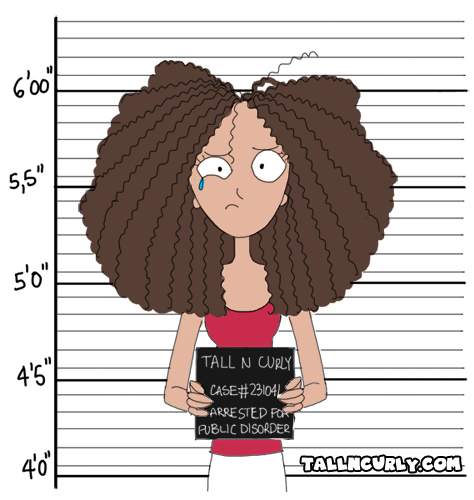 In over a year and a half, I’ve been having lots of fun drawing and sharing tall girls and curly girls issues, as well as some random thoughts. Reliving some of my biggest traumas over again and again while drawing these little comics have been a psychotherapy on its own. But what I’ve also liked – besides finally finding the right thing to say to someone who had bugged me weeks before and sharing my amazingly witty line with thousands of random strangers instead of throwing it in the right face – has been to get in touch with all these great and amazing ladies and girls from all around the world – and with around maybe one and a half men. Be reassured, I’m definitely not done with comics about tallness and curliness. Still looots of annoying questions, cheesy pick up lines and indelicate people ahead – along with some more inspirational stuff too! Let’s try not to commit suicide by strangling ourselves to death with our curls or by jumping from the top of our long legs here, come on ladies. Instead of listing all the things I will post about in the future, I’d rather have you discover them one by one, each time I will actually post an article under a new category. I will still introduce two of these categories right now, as they will appear soon. The reason why I decided to include a music section to my blog is very simple : music is – right after saving animals – one of my main reasons for living. I might write about some new releases from time to time and about big past and present hits, but here you’re most likely going to hear about music that is not played on mainstream media, whether it’s some less famous songs by very famous singers, one hit wonders that I believe should still be around today, music from all around the world and present talented artists that don’t get as much exposure as I believe they should. I’ll also have an amazing sidekick who will write about these subjects from time to time. Can’t wait for you to meet her! Meanwhile, you can read my post Beautiful Health to understand my approach to beauty and health. I discovered your blog just before the changes and I must say I’ve become addicted. I’m also tall and fight with the hair straighteners due to my slighly wavy hair.